The ShapeRange collection object represents a collection of Shape objects that may contain all, some, or just one of the Shape objects in the drawing layer of a worksheet. A ShapeRange collection object can be constructed from the current shapes using any of several criteria defined in decision structures (If/Then). For example, a ShapeRange collection object could be constructed out of just those shapes that are of type AutoShape, or perhaps only those Shape objects that are lines. If you want to return all selected Shape objects to a ShapeRange collection object, use the ShapeRange property of the Selection object when it represents a group of selected Shape objects. 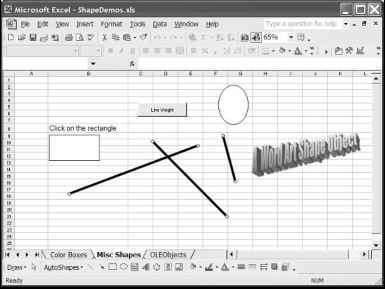 TheMisc Shapes worksheet from the ShapeDemos.xls workbook. 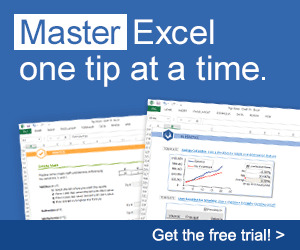 The first line selects all Shape objects in the active worksheet. The second line sets the angle of rotation to 30 degrees for all selected Shape objects. The third line sets the angle of rotation to 60 degrees for the first Shape object that was added to the collection (out of those objects currently selected). To return a subset of the Shape objects as a ShapeRange collection object, use the Range property of the Shapes collection object. The SelectLines() procedure uses a For/Each loop to iterate through the Shapes collection object for the active worksheet and build a parameter array (lineNames declared as variant) containing the names of the Shape objects of type msoLine. The name of each object of type msoLine is copied to the lineNames array for later use. Next, the parameter array is passed to the Range property of the Shapes collection object, and objects of type msoLine are returned and selected. Additional code can now be added to modify the selected shapes. In this example, the ShapeRange property is used to return all the selected shapes and set the thickness of the lines via the Weight property. Figure 10.6 shows the result of applying the preceding procedure to the shapes contained in the worksheet displayed in Figure 10.5. The preceding procedure represents a useful method for selecting a range of Shape objects of a particular type when you don't know the proper names or index values at Design time. TheMisc Shapes worksheet after execution of the SelectLines() sub procedure. WHAT IS A SHAPERANGE vba? 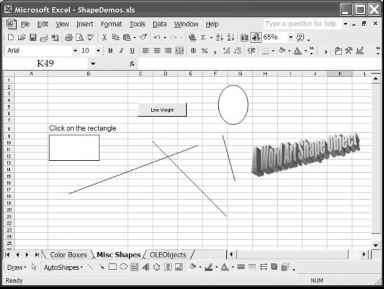 How to use shape range by vba? Can we define a shaperange vba?